Hi everyone! 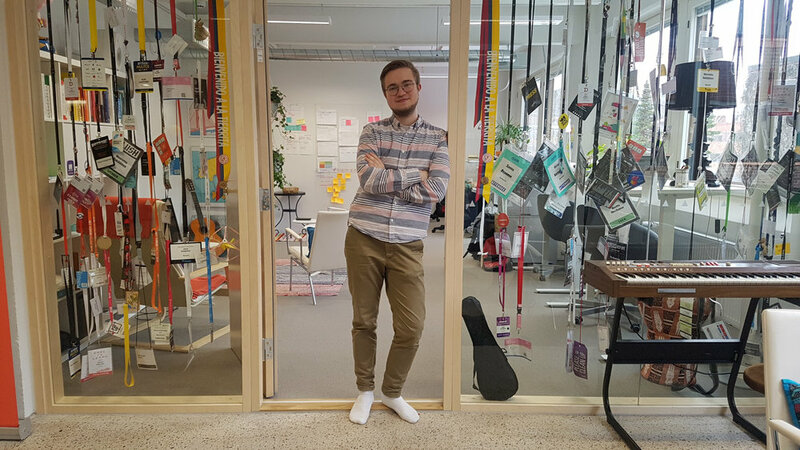 My name is Miska, and I started two months ago at Mehackit as impact and growth hacker. In this blog post I’m going to tell my story about how I ended up here, as well as why I think Mehackit is really making a difference in this world. As impact and growth hacker my main task is to casually lean against the doorpost of our office at aGrid. Nope, just kidding - I have various tasks, including writing and editing our blogposts! There has been a lot of buzz about growth hacking in startup scene for quite a long time. This buzz woke up some interest also in Mehackit. My colleagues were having the “should we hire someone who knows something about this?”-talk meanwhile I was looking for a job, where I could make a difference. As a result, I decided to apply for Mehackit to do something related to marketing, communications, sales, and so on. I had been an instructor here before, and I knew how inspiring the courses of Mehackit were. I was contacting Mehackit at the right time, so after we had a talk, they hired me. Now what I do here is called impact & growth hacking. Because Mehackit is a socially impactful business, it’s more accurate to talk about impact hacking. The mindset and tools are the same as in growth hacking, but the goal is different: to exponentially grow the impact of business. Luckily, Mehackit’s mission is clear: democratizing access to technology and supporting healthy use of technology by empowering young people. To me, our mission seems to be something this world needs - it’s a powerful message to everyone. Young people need education about technology and how it can be used for different purposes. Everything is digitalizing, and technology plays the main role in that. From my point of view, I have targeted to jobs that fulfill the definition of Ikigai. Ikigai is a Japanese concept, “a reason for being”. It’s composed from four aspects: 1. What you love, 2. What you are good at, 3. What the world needs, and 4. What you can be paid for. So far I have succeeded to get such jobs, and I consider myself lucky, since in IT field it’s sometimes challenging to get a job where one can really meet the world’s needs. Ikigai - a reason for being and the way I view my life. As I see it, the world really needs humanity, empathy, equality, and equity. The use of technology is polarising communities against each other without the users realising the one-sided opinions they are being exposed to. And the main key to solve that problem is to give people a chance to understand how they can use technology healthily. As it’s said, young people are the future, which is exactly why we at Mehackit focus on educating young people and their teachers to make technology more approachable to everyone. How we do it? Not by making more apps or devices, but by helping to create with technology and know more about its possibilities. Our tool to make our mission happen is the learning platform, Mehackit Atelier, which contains professional development track for teachers (Let Me Hack It) and three creative content tracks for students (Music, Art, and Electronics). All of them support healthy use of technology by training educators and young people to be the masters of technology. I have instructed two Electronics and Programming courses in high schools, and I have never seen more excited faces in any class than in these courses, so I personally recommend to get familiar with Atelier! Project-based learning, curiosity and creativity - all three supported by Mehackit Maker kit!